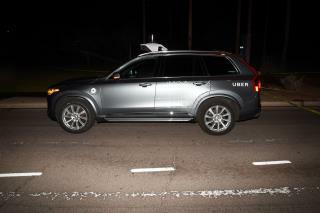 (Newser) – Family members of the first American killed by an autonomous Uber vehicle have settled with Uber itself, but now they're going after an Arizona city for the homeless woman's death. Per the Arizona Republic, Elaine Herzberg, 49, was killed March 18, 2018, in Tempe by an Uber Volvo SUV as she walked her bike across the street that night, outside a city-designated crosswalk to the north. Rafaela Vasquez, the driver behind the wheel while the vehicle was self-driving, was watching The Voice right before the accident, per a police report. Herzberg's daughter, Christine Wood, and husband, Rolf Ziemann, are now asking for $10 million from Tempe because they say the city had a brick pathway, since removed, that encouraged pedestrians to jaywalk by using the path that was "clearly designed to accommodate people to cross at the site of the accident," the claim notes. A self-driving vehicle will not ever be the same as a human-driven vehicle. Why? Very easy. The electronic components that comprise a computer are made of metals and plastic. However, a human soul can only be breathed into a human body. If a human being could learn and understand why this most basic of facts is true, their life would improve in a countless number of ways. Elaine Herzberg lost her life because the self-driving car industry has failed to wrap their collective brain around this fact. How very sad. Local news said there have always been signs in this area warning people to cross at the intersection. Its a college town and J-walking is highly enforced around ASU. The self driving car doesn't stop for pedestrians or bicycles in its way? Scary.